When I was given the opportunity to come to Sudan as a UN Volunteer with the United Nations African Union Mission in Darfur (UNAMID), many folks discouraged me, because of the hardship conditions. I refused to listen to the naysayers and didn't hesitate to accept the offer. My whole life has been full of challenges and hardships, and so Darfur would be no different. I told them that I was willing and able! My name is Mohammad Sarhan. I am a UN Volunteer working with the Communications and Information Technology Section (Human Resources) for the UNAMID. I was born a refugee in the occupied territories of Palestine, and was raised in Al Farah Refugee Camp in Nablus. As a child, instead of being inoculated against polio, I was mistakenly injected with the polio virus. I endured five surgeries as my mother sought to rehabilitate me. Nevertheless, thanks to her moral support I have felt I could accomplish anything. I studied computer science in the US and eventually worked with the United Nations Relief and Works Agency for Palestine Refugees in the Near East where I helped develop the agency's Disability policy. I have always been passionate about volunteering. As soon as I arrived in Darfur, I realized that there was so much to do for this community. I needed to start advocating for the cause I have worked on my whole life: disabled persons. I found out about the Darfuri Disabled Club that opens its doors every afternoon to people with deafness, blindness and physically disabilities. The first time I visited the club, I witnessed a very modest place but with a lot of potential. The club facilities manage to offer services such as social care, training and rehabilitation. But the thing that attracted me the most was the workshop. Despite the lack of elaborate tools and equipment, but armed with a welding machine and a drill, the members make some prosthetic limbs and adapt wheelchairs to be driven by hand using the bicycle system. The women do handmade crafts. The club feels like a small factory. That visit increased my desire of working for the disabled community in Darfur, and that is why I am actively working with the Club administration to raise awareness and funds to put together a project that aims to empower their activities in the workshop and in the rehabilitation clinic. Bio: Mohammad Sarhan is a UN Volunteer working for the Communications and Technology Section (Human Resources) of the United Nations African Union Mission in Darfur (UNAMID), supporting the Darfuri Disabled Club by raising awareness and funds for their workshops and services. 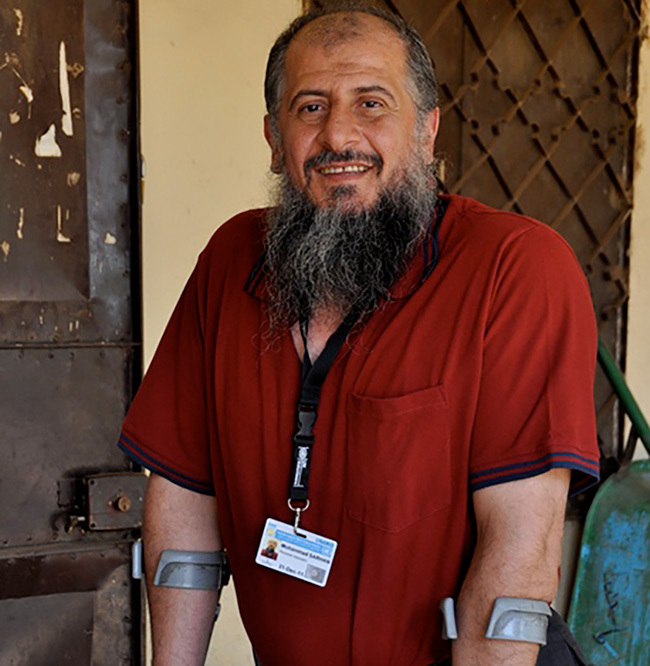 Born a refugee in the occupied territories of Palestine and infected with the polio virus as a child, Mohammad worked with the UN Relief and Works Agency for Palestine refugees in the Near East prior to UNAMID, where he helped develop the agency's disability policy.